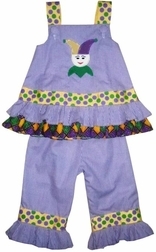 We love Mardi Gras and here is our custom Mardi Gras jester or mask dress or outfit for little girls!! The traditional colors of Mardi Gras are of course yellow, purple and green. Using this famous color scheme we take purple gingham and pair it with Mardi Gras dots ribbon and harlequin fabric. You can choose a dress or a swess top (long swing top) and pants. One of the cutest things? A little Mardi Gras jester or mask is appliqued on the front!